8/20/99 at 10:30pm PDT, at the SJAA public star party at Houge Park, we were entranced by a lovely pair of rays in Palus Epidemiarum. 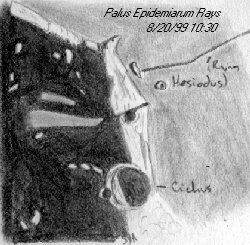 I made this sketch with my VX102 refractor (then flipped it later to match with the map view), but in a nearby 10" reflector, interesting detail was visible, barely illuminated by the rays, on the floor of Palus Epidemiarum. Tonight offered up a clear winner in the Marsh of Nasty Diseases; the "bad skin" was irresistable. It was placed ideally right at the terminator, and I was able to trace out every last thread of Rimae Ramsden and Hesiodus. But just tracing them wasn't the point; in the C8 they were dark and distinct enough to literally look like rayed cracks in the floor, a wonderful aesthetic. Capuanus looked oddly overfull in the early morning light, giving an impression similar to Wargentin. The central peak in Campanus was very distinct tonight (edgy seeing with breaks of steadiness between clouds...) and it made a nice pair with Mercator. The light was simply ideal to show this area at it's best, including (of course) the Hippalus rille structure crashing into Agatharchides. I've been struck before by how this crater/wreck looks like it leaked out into the rille and down toward the Palus. On another night, I got a very good look at them last night (July 4) through several scopes, including a 7" AP and a 7" Questar. They're incredible; crosshatched kind of like Triesnecker but both easier and more complex. The variation of thickness and angle of the light made this observation one of the more fascinating I've seen on the moon, since the angle was low and it was possible to watch the "visibility" change from half-hour to half-hour. Alternately, for some reason I found rima Hesiodus more difficult than usual. See also discussion on Rukl chart 53. The Swamp of Epidemics is a large, flat bay with 5 small peaks poking up through the lava floor. There are also several very ruined craters that just appear as a short arc to mark their passing. The floor is somewhat darker than Mare Nubium. I observed a sunrise ray in Lacus Timoris at 19:38 the evening of Jan 12, 2003. The ray extended from the eastern lit portion of the lake through the break for approximately 60 km. The break in the mountains is at lat. 39.2S, long. 28.5W and ended to a group of mountains, which stick up above the mare floor (roughly a horseshoe shape). Seeing conditions were very good with brief periods of excellent, the temp. was 20 F, and the wind light. I was using a 12.5" Dobsonian at approximately 175X. 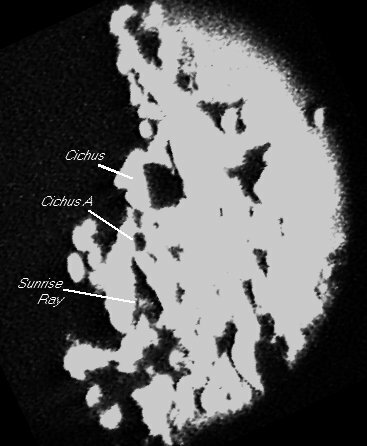 2/24/99: I was observing the terminator (20:00 EST) near the crater Cichus. Just to the south of the Cichus A crater (Rukl Chart 63) is a triangular depression. I observed what appeared to be a sunrise ray. The ray projected westward from the notch in the wall of the triangular depression (located at approx. 36.5 deg. south, 20.5 deg. west) onto the floor. Later (20:30 to 20:45) the ray broke up along the south-southeast side into jagged peak shadows (similar to the type of shadows that are easily seen on the floor of Plato). I video taped this area of the moon, to document what I saw, but the quality is not the best. See the digitized version at right. The ray may be seen clearly on the original video. I'm attempting to use a camera and the original video to produce a better quality picture. The telescope I used was a 12.5-inch Dobsonian. Has anyone else observed this sunrise ray? Please let me know! A pretty small crater with two small central peaks. There is lots of terracing in the walls and a small, fresh crater on the rim in a PA of 120. A large ghost crater with three straight mountain ridges pointing away from it; Capuanus looks like a bear paw and claw (see the above image -- Capuanus is at the bottom just left of center, with the "claws" extending more or less upward). It's the western anchor point for long Rima Hesiodus. All the rilles and other striations in this area make it look like the bear claw has been scratching away at Palus Epidemiarum. A ruined crater, lots of lava has filled in this old marking. The floor is flat and the walls are almost gone, especially in PA 270, the wall is very low in this area. There are 4 small craters in the wall and 2 on the floor. 3 "fingers" of other ruined craters and small mountain ranges extend outward from the wall of this crater in PA's of 30, 60 and 90 degrees. Remembering the name itself led to the curious mnemonic "gibbous da money or we Capuanus." A medium size crater with pretty steep walls and some terracing. What is fascinating about this object is that it is surrounded by rilles. A cross hatch of rilles are attached to this crater in PA's of 0, 30, 220 and 270 degrees. A unique crater in my memory. Note Rima Hesiodus (see Rukl chart 54), and the complex of rilles just east of Ramsden. Just a bit south of Rimae Ramsden is the curious double crater Hainzel and Hainzel A. Just at sunrise, "A" had the most spectacular example of terracing I've noticed on the moon. The impression was well expressed by Wm Phelps as looking exactly like the terracing in a hillside rock quarry. It was easily that distinct in the opportunistic light. The structure of the crater makes one wonder, in fact, why this specacular "A" is named subordinant to the more subdued Hainzel.